After Friday’s games, the three-team race for the final South Division playoff spot has gotten tighter with 3 games left. 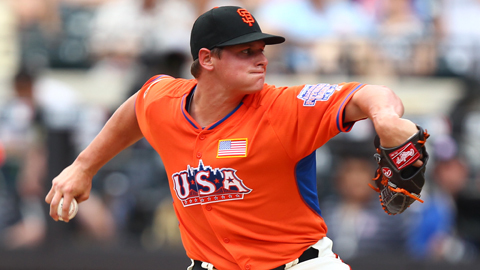 The 66ers beat Lancaster 12-8, the Quakes beat Lake Elsinore 9-0 and San Jose beat High Desert 12-3. The 66ers and Lancaster are tied for 1st in the second half race. It’s as simple as this for the 66ers: If they win 2 of the final 3 games against Lancaster, they are in the playoffs. They could still tie for the second half title with LE, but as stated in a previous post, that would be enough to get the Sixers in. There would be no 1-game playoff. Should the Sixers lose at least 2 of the next 3 games, the last spot would go to High Desert or the Quakes. After Friday’s games, those teams are tied for the last spot. They COULD have a 1-game playoff. And it would be at High Desert on Tuesday, because HD won the season series, 13-11. Given the stakes, it could go down as one of the greatest games in California League history, which began 72 years ago. Abel Baker’s fifth hit of the game, a double with two outs in the top of the 15th, scored Angel Rosa with the go-ahead run and the 66ers downed Lancaster 4-3 in Game 5 of the South Division Finals. The Sixers will host San Jose in the best-of-5 South Division Finals beginning Thursday at San Manuel Stadium, after San Jose downed Visalia 9-5 in Game 5 of the North Finals on Wednesday. Game 2 of the Championship Series is also in San Bernardino. Games 3, 4 and 5 are in San Jose Saturday-Monday, if necessary. The game not only lasted 15 innings, but 5 hours, 31 minutes. The Sixers were down to their final out before Brian Hernandez singled home Zach Borenstein from second base in the top of the ninth to tie the score 3-3. There were plenty of opportunities, but some remarkable pitching (or poor clutch hitting depending on how you look at it). The Sixers had 22 hits but left 22 on base and were 3 for 16 with runners in scoring position. The JetHawks had 13 hits but left 16 on base and were 4 for 16 with RISP. Sixers reliever Ty Kelley (1-1) pitched out of not 1, but 2, bases-loaded, no-out situations, 1 each in the 13th and 14th innings. The first time was a strikeout then a double play, the second time was a double play and then a strikeout. The Sixers had a losing record in the regular season, but are advancing to the Cal League Championship Series. Is that rare? It is, but not as rare as you might think. Lake Elsinore did that in 2011 en route to winning the league title, the San Bernardino Stampede did it in 1997 before falling in the finals. Bakersfield did it in 1984 before losing in the finals. 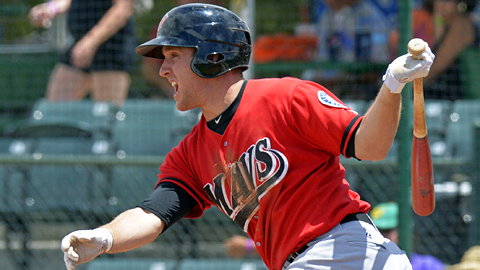 Inland Empire outfielder-designated hitter Zach Borenstein, 23, has been named California League Most Valuable Player. Borenstein is leading the league in hitting (.332) and slugging percentage (.628), is second in home runs (25) and fourth in RBI (87). He was on the disabled list for a month with a hip injury which possibly cost him a shot at a Triple Crown. He has notched career highs in every offensive category except doubles. Borenstein is the first Sixer to earn MVP honors since Carlos Santana in 2008, Santana played in San Bernardino when it was a Dodgers affiliate and is now the starting catcher for the Cleveland Indians. Borenstein led a group of four players from Inland Empire who earned All-Star team. The others are second baseman Alex Yarbrough, first baseman Michael Snyder and pitcher Mark Sappington. All are still with the Sixers except for Sappington who was promoted to Double-A Arkansas three weeks ago. The lone representative for Rancho Cucamonga is outfielder Scott Schebler who is hitting .307 with a league-high 23 home runs and eighth in RBI (83) and is hitting .274. Rodney Linares of Lancaster is the Manager of the Year. His team is 75-54 overall. The JetHawks won the South Division first half and have a seven-game lead in the second with 11 games left. Dan Winkler (12-5, 2.97) of the Modesto Nuts is the Pitcher of the Year. Vincent Velasquez, a Garey High product who was the 58th overall pick by the Houston Astros in the 2010 draft, made his California League debut on Tuesday for Lancaster. After allowing three baserunners and no runs in the first three innings, the right-handed Velasquez ran into trouble against host Lake Elsinore. In the fourth, he allowed 10 men to come to the plate as the Storm scored five runs on a home run, two walks, five singles and a wild pitch. He was replaced with two outs. His final line: 3 2/3 innings, seven hits, five earned runs, three walks, four strikeouts, one hit batter and one wild pitch. He threw 79 pitches. He also took the loss in a 5-4 Lake Elsinore win. Tanner Peters of Stockton and Patrick Kivlehan of High Desert earned weekly accolades in the California League this week. Kivlehan, a 23-year-old third baseman out of Rutgers, went 13 for 25 (.520) with three doubles, three home runs and 16 RBI. Kivlehan’s week was highlighted in a 5-for-7 showing in a 30-8 win over Lancaster on Friday. The Mariners prospect, who was the MVP of the Northwest League last summer, is hitting .328 with 39 RBI in 49 games since joining the Mavericks. Peters, 23, came within two outs of throwing a perfect game on Friday against Modesto. He retired the first 25 batters he faced before yielding a one-out double in the ninth. 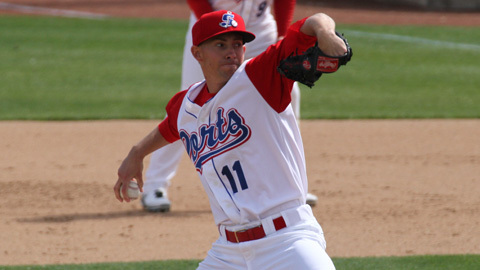 Peters struck out a career-high 14 batters to give him 132 on the season — second-most in the A’s organization and third-most in the Cal League. He has won his last four decisions to improve to 11-5.. Baseball America has announced the results of its annual Best Tools survey which asks the managers in each league to evaluate the prospects they think are best at each position in each facet of the game. Inlnad Empire had one player singled out as Alex Yarbrough was named Best Defensive Second Baseman. I think Eric Stamets should have been named Best Defensive Shortstop but Modesto’s Trevor Story was named. Rancho Cucamonga’s Jon Garcia, who has since been promoted, was named Best Outfield Arm. The Inland Empire 66ers and Rancho Cucamona Quakes both return from an off day in pursuit of a California League playoff berth and will start a head-to-head three-game set at 7:05 tonight at San Manuel Stadium. The Sixers (58-50 overall, 21-17 second half) finished second to Lancaster in the first half and are second in the second, two games behind that same opponent. They are in good position to make the postseason as a wild card if they don’t win the half at 4 1/2 games better than Seattle affiliate High Desert and eight better than the Quakes for the second playoff spot. If Lancaster, a Houston Astros affiliate, wins the second half too, the two teams with the next best records would advance. The Quakes (50-58, 19-19) have been a much better team in the second half and come into the set having won seven straight series. They are four games behind Lancaster for the half and 3 1/2 behind High Desert for the second wild card, assuming Lancaster wins the second half. 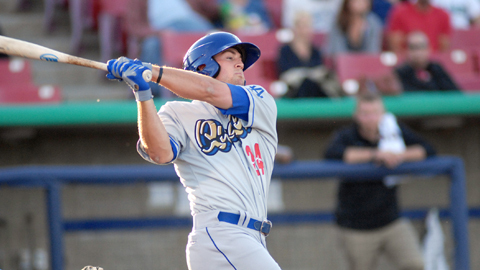 The Sixers are led by reigning Cal League Player of the Week Zach Borenstein while outfielder Scott Schebler has spearheaded the Quakes resurgence. Carlos Frias (2-3, 4.11) is the scheduled starter for the Quakes while the Sixers counter with All-Star Mark Sappington(10-4, 3.42). Designated hitter M.P. 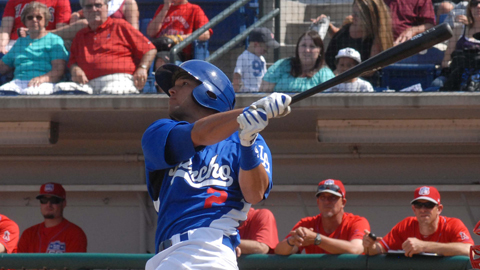 Cokinos of Lancaster is this week’s California League Offensive Player of the Week. He hit .545 (6 for 11) with two doubles, a hone run, five RBI and seven runs scored in a four-game sweep of Rancho Cucamonga. Cokinos, 23, has played 47 games and its hitting .339 with 16 doubles, six home runs and 43 RBI. Pitcher of the Week honors went to Shane Dyer of Bakersfield. He held High Desert to four hits and went seven innings in his only start of the week. He didn’t walk a hitter and struck out five. Dyer, 25, is 2-0 with a 1.37 ERA in four starts for the Blaze, a Reds affiliate. All 10 California League teams return from the All-Star break today and begin the second set of 70 games. Inland Empire, which finished second to Lancaster in the first half, will host Padres affiliate Lake Elsinore at 7:05 p.m. at San Manuel Stadium. Orangel Arenas (3-3, 6.19) will be on the mound for the Sixers. Rancho Cucamonga will be on the road with a series at Lancaster, an affiliate of the Houston Astros. In other games, High Desert will be at Bakersfield, San Jose at Stockton and Visalia at Modesto. San Jose was the first half champion in the North Division. Walkoff wins are always exciting. When it’s with a home run, it’s even better. Now put a first-half title and playoff berth on the line, well it doesn’t get much better than that. The Inland Empire 66ers won in that fashion on Wednesday as Alex Yarbrough roped a three-run shot to left with one out in the bottom of the 11th for a 7-4 win over Stockton at San Manuel Stadium. It was huge because Lancaster beat High Desert 10-3 to stay two games in front with four left. That still might be tough to overcome but three out with four left would have been almost impossible. The Sixers (35-31) stormed the field and Yarbrough was later the recipient of a shaving cream pie during the on-field post-game interview. The Sixers still have a tough go. They now play four against High Desert (32-34) to end the half while Lancaster (37-29) has last-place Lake Elsinore (26-40), although the Storm have been playing much better lately. Nothing beats a pennant race!